Dirk’s Fish is a fish shop. They sell filets of fish, fish salads, sea food, some gourmet items all from a beautifully displayed deli case spanning the length of the shop. They also, however, have a lunch menu that many folks don’t know about. That is, they will craft sandwiches from lobster rolls and soft shell crab on white toast to sushi rolls as well as a couple seasonal items. The menu is limited but everything is incredibly fresh and prepared with care. 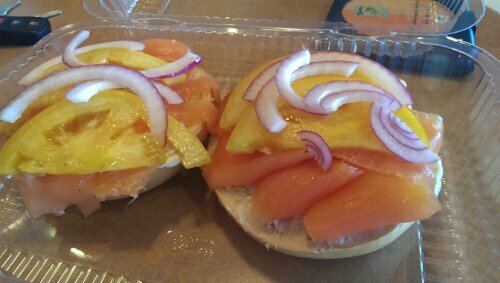 Lox and Bagel. For ten bucks you’re served a nice sized bagel – I apologize, I don’t know where it was purchased, but I do know it was soft and held up nicely to the toppings. The cream cheese was your standard deli style variety. I’m not sure if it was made in house, but it was great and plentiful. The garnish was a freshly sliced yellow tomato. It was sweet and juicy. Sliced the right thickness it was all that was needed besides a few slivers of red onion. Capers? Not here, but that’s fine. This lunch was all about the fish. The lox. This was some of the most gorgeous textured smoked fish I’ve tasted. It melted in your mouth as though it were the filet of the sea. Buttery, fatty, just absolutely perfect. This was what smoked salmon was supposed to taste like. The difference was also in the hand slicing that was performed minutes before consumption. 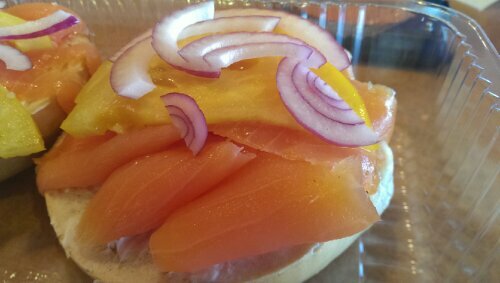 If you’re like me and travel for great lox, this should be your next stop. Remember, tell ’em Hungry Hungry sent ya. ← #139 – Sunda. Outside the box.